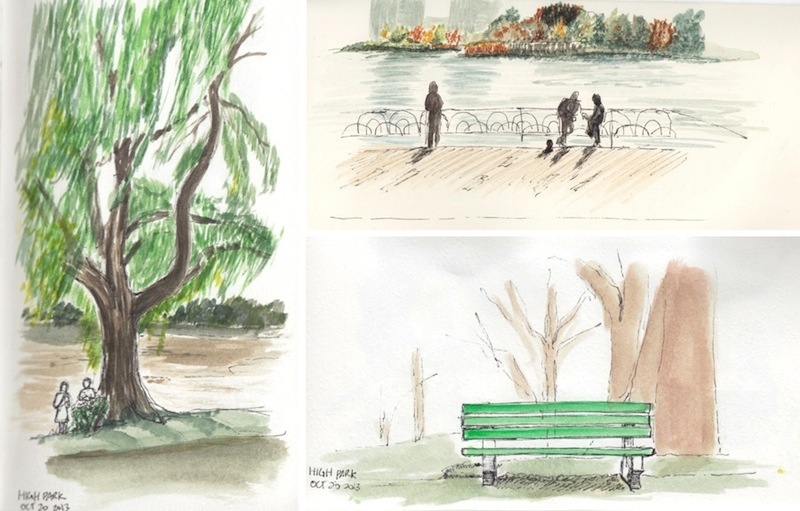 This weekend, a couple sketchers met at High Park to do a little bit of sketching. Luckily, the weather was nice and comfortable enough to draw and paint outside. It's was my first time visiting High Park, which is located on the west side of the city and walking distance from the subway. Toronto never ceases to amaze me with the amount of green spaces you can find right in the city. This park is huge! There were so many great scenes to sketch, I barely scratched the surface that day. I spent most of my time near the giant Grenadier Pond, watching people walking by with their family and friends. It was a very relaxing area. I will have to come back again at some point to explore the park a little more.